Changes in the effective optical density of the cones are sufficient to explain changes in color matches with retinal illuminance and pupil entry. We performed three experiments. In the first experiment, six observers made color matches under both bleached and unbleached conditions to a series of six standard wavelengths. The effects of bleaching could be modeled by a decrease in optical density of the L and M cone photopigments. Slight spectral shifts in the peak wavelengths of the photopigments were required for different observers. In the second experiment we varied retinal illuminance of the color-matching field from 2.4 to 5.4 log Td for a series of long-wavelength primaries. The shape of the color match versus the intensity function was unchanged by the wavelength composition of the matching field. In the third experiment we measured the change in color match with retinal illuminance for different pupil entry positions. At low luminances there was a marked dependence of the color match on pupil entry positions. At high illuminance there was only a small dependence. The half-bleach illuminance values varied as expected from the Stiles–Crawford I effect. 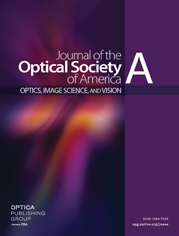 We conclude that for wavelengths >540 nm, changes in color matches with bleaching and pupil entry can be explained by changes in the effective optical density of the cones.